Last Thursday at the 2014 Chicago Auto Show, Hyundai revealed the latest addition to the Veloster lineup and the follow-up to the popular RE:MIX Edition that debuted at SEMA in 2012: the Hyundai Veloster RE:FLEX. The Veloster RE:FLEX will feature the choice of red or black leather seating, projector headlights with LED accents, LED taillights, unique RE:FLEX badging, and a number of chrome accents. Standard features, borrowed from the Veloster’s Style Package, include a 450 watt eight speaker audio system from Dimension, leather-wrapped steering wheel and shift knob, and a 7” touchscreen. The Veloster RE:FLEX will be powered by Hyundai’s Gamma 1.6-liter four-cylinder engine, mated to a six-speed EcoShift® dual-clutch. Available in Century White, Vitamin C, Ultra Black, and Boston Red, the RE:FLEX will also boast an exclusive Ice Pearl coat (as seen on the model displayed at CAS). In addition to the reveal of the Veloster RE:FLEX, Hyundai also announced a number of new features for the upcoming 2015 Genesis and other future vehicles. 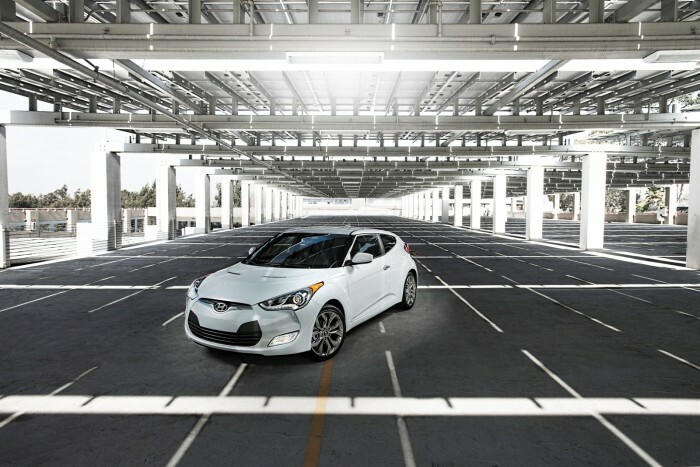 Additionally, the brand took home the top prize in WOMMA’s “Driving Engagement” Awards (for The Walking Dead Chop Shop campaign), and the Veloster Turbo won Kelley Blue Book’s Best Sporty Compact prize in the annual 5-Year Cost to Own Awards. For more from the Chicago Auto Show, stay tuned to The News Wheel throughout the week!